“It’s the shine,” He flippantly answered. Jimmy’s response was muffled by the sound of Noah’s favorite record, Prohibition Blues. “I ran into a snag,” Jimmy retorted. “Got it,” Jimmy said twirling a teacup around his finger before filling it with a cocktail. “Mr. Bugsy, Jimmy will see to all your needs,” Noah graciously offered, doing his best to make a good impression. “Just a few weeks,” Jimmy said, obviously intimidated by Bugsy’s imposing stature and holstered revolver. “That’s a pretty good deal kid,” Bugsy grinned. “What will it be?” Jimmy asked. “Strongest you’ve got,” Bugsy challenged. Jimmy reached under the bar and grabbed one of the new bags. With the paper still neatly wrapped around the bottle, he generously filled the cup. Bugsy took a swig and sighed loudly. “Tell me you didn’t!” Elenor gasped in horror. Elenor stared blankly at Jimmy. “What now?” she asked. Before Jimmy could respond, they heard a thud in the next room. They raced out to the bar to find Bugsy lying motionless on the floor. As the final guests were leaving, two officers slipped in the back door. They stood over Bugsy and quietly spoke to Noah before approaching Jimmy. Elenor rested a hand on Jimmy’s shoulder to steady his shaking. “Just tell the truth…it’ll be okay.” she assured him. “A business deal?” one of the officers asked curiously raising an eyebrow at Noah. When he reached his house, Jimmy walked over to his father’s easy chair and collapsed. His mother handed him a cup of tea and sat beside him. Group silhouette, Weston Profiles, New York, ca. 1840-50. Bequest of Mrs. Helen Shumway Mayer 2003.13.35. 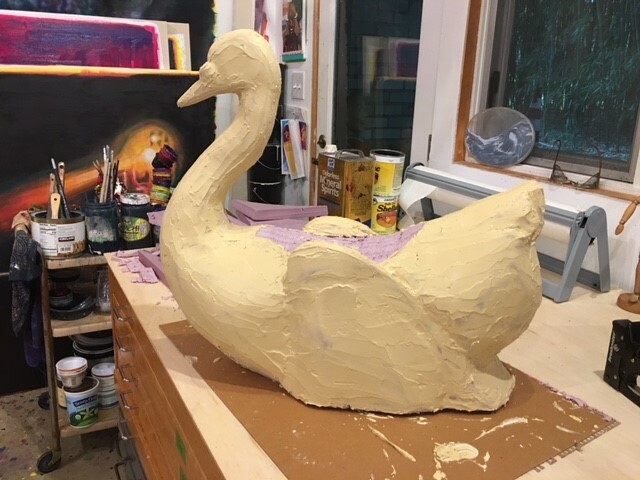 In the first Silhouette Sleuthing blog post, I detailed how I discovered that one of the silhouettes in the Winterthur collection had been misattributed to artist Mary Pillsbury Weston, who was most famous for her Spirit of Kansas painting exhibited at the Columbian Exhibition. There is no evidence to suggest that she ever produced and sold silhouettes. If the Weston profiles were not created by Mary, then who created them? Detail of Weston signature on the silhouette in the Winterthur collection. 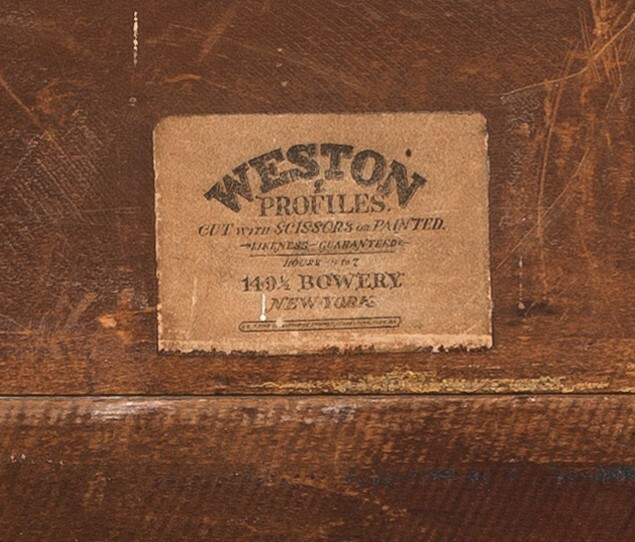 Since most of the silhouettes have a “Weston Profiles/149 ½ Bowery” label attached to the back of the frame, it indicates that they have a common source. However, this does not solve the mystery of the address, since no Westons have been found at 149 ½ Bowery, as discussed in the previous blog post. Could these silhouettes be fake? 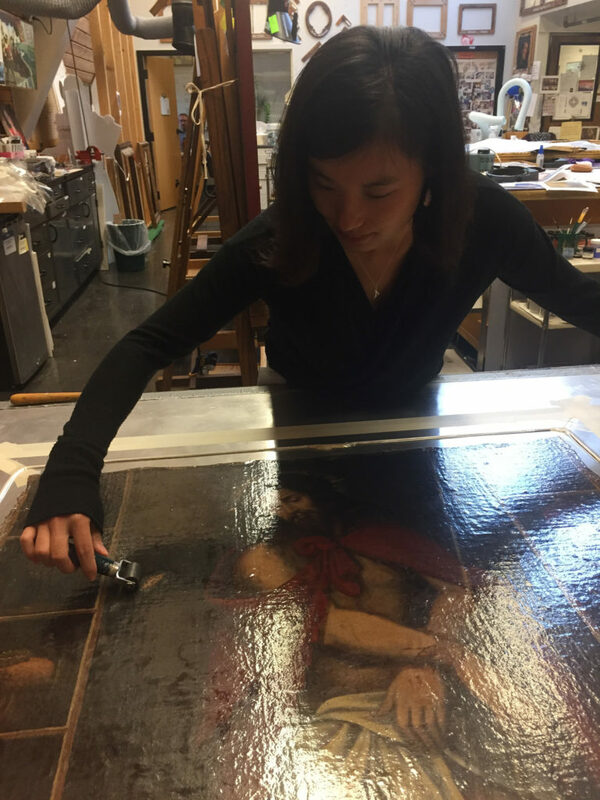 Winterthur Paper Conservator Joan Irving examined the Weston profile in the frame, and there were no red flags to suggest it was not produced in the nineteenth century. However, she did note that the label appeared to have been cut down at some point. This does not mean that the silhouette is fake, it is possible the piece was reframed at some point and the label reaffixed to the new frame. Detail of label on back of the frame. If we accept the material evidence that these silhouettes were made in the 1840s, and there are no known Westons living on Bowery at this time, who or what was at 149 ½ Bowery? The only reference to a 149 ½ Bowery found in primary sources is J. Wilson Fancy Goods Store listed in the New York Mercantile Union Business Directory in 1850. This reference seemed promising since a silhouettist could have operated out of a fancy goods store. J. Wilson, however, could not be traced to that location prior to 1850 in Trow’s New York City Directory. Looking at what businesses worked out of 149 Bowery during the 1840s, I found a distillery, leather working, and saddlery at this location. 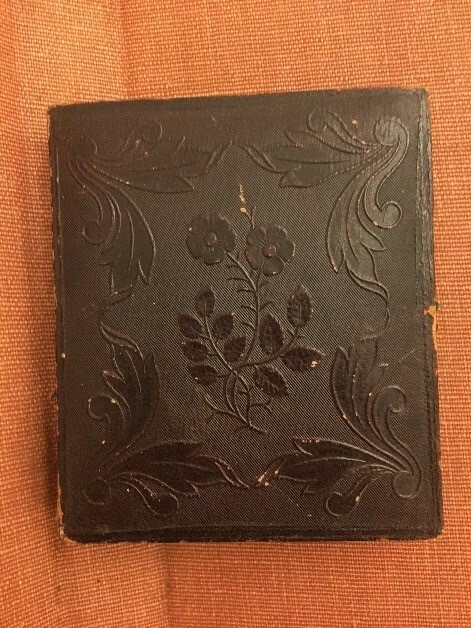 The leather business is possibly the closest connection, since cases for miniatures, silhouettes, and daguerreotypes typically utilized leather, and I found a group of Westons who operated a daguerreotype business in the city. This group of Westons can be found in the New York City directories during the period of production, and they include a John P. Weston, a Robert Weston, and another Mary A. Weston—all of whom were daguerreotypists. This was a promising avenue because the career jump from silhouettist to daguerreotypist would not have been surprising in the period. Silhouettes were a cheap, quick, and easy way to produce form of portraiture, some even employing the physiognotrace or pantograph machines, which are considered forerunners to photography. (2) Boundaries between what we understand as “fine artist” and “daguerreotypist” were fluid with some artists producing both artwork and daguerreotypes at the same time, and others using the technology to help with their artwork. Photography eclipsed silhouettes in the mid-nineteenth century as a more accurate and equally easy method to produce mode of portraiture. According to the directories, James P. Weston operated in New York City as a daguerreotypist from 1842 to 1857. In 1842, James partnered with artist William Hendrik Franquinet to create a series of daguerreotype views of the city of New York and continued to work as a daguerreotypist throughout the 1840s and into the 50s. (3) Unfortunately, James P. Weston disappears from the records after 1857. The husband and wife pair, Robert and Mary A. Weston, were also in the daguerreotype business. The 1850 Federal census lists English-born Robert Weston as an artist, while the 1855 New York Census reports that he worked with daguerreotypes. (4) Mary’s profession is never listed in either census. Possibly blood relatives, Robert Weston and James P. Weston were listed together at 132 Chatham and 192 Broadway as daguerreians through the 1840s and 1850s. She eventually moved to California in 1874 to be with her siblings, where she died three years later. The Westons operated close to the 149 ½ address. Their closest relation to this address lies with a leather factory. In 1845, James P. Weston used the address 43 Eldridge for his daguerreotype submission to the American Institute and the Mechanics’ Institute Art Fair, an address he shared with Walter S. Abbott of Abbott & Smith Saddlery. Between 1842 and 1843, Abbott & Smith Saddlery is located at 149 Bowery. Did the two men know each other? Could Weston have operated a studio out of Abbott’s shop? Did Abbott make cases for Weston? These three Westons are the likely makers of the silhouette in the Winterthur collection. James and Robert exhibited works in the American Institute annual fairs. 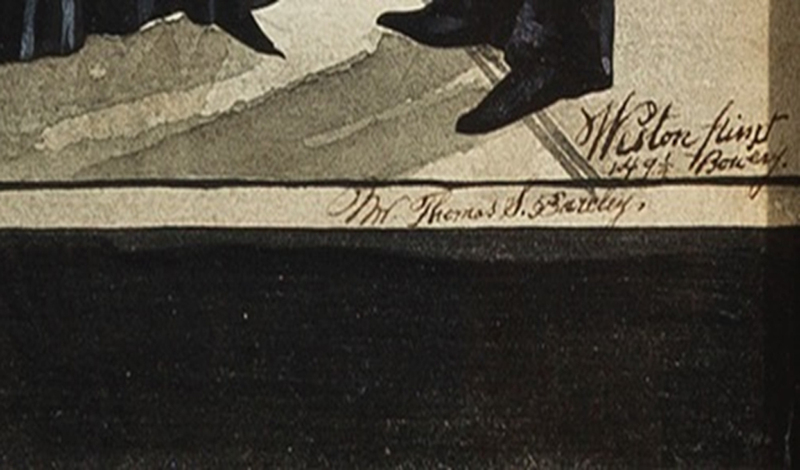 Robert submitted a “pen & ink drawing” at the 1846 show, (6) showing that he had the ability to produce at least the silhouette’s background. If Robert, his wife, and James were in business together, that could account for the different styles in signature and silhouettes that are found on Weston Profiles, i.e. block serif script versus cursive script. None of the silhouettes have a first name included in the signature but that is similar to the daguerreotypes produced by the Westons, which can be found in the New-York Historical Society, the J. Paul Getty Museum, and in auction houses. These pieces usually include the name “Weston” and the studio address across the bottom of the frame. Case for Weston daguerreotype of John Snowden, MD., c. 1845–1852, Cased Image File, Item 2-289, PR 12, New-York Historical Society, New York, NY. 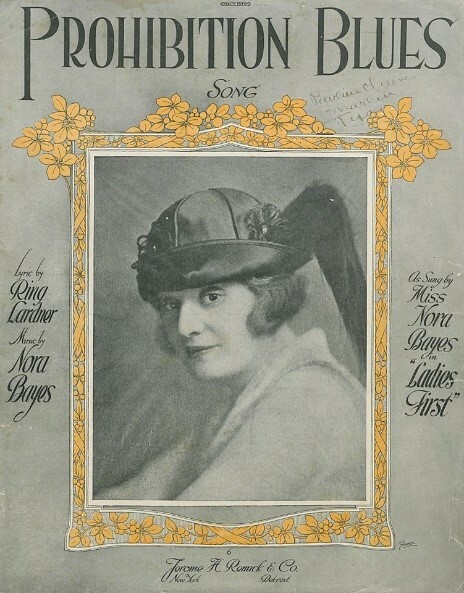 While research concluded that Mary Pillsbury Weston was not the creator of the Weston Profiles, another Mary Weston was most probably involved. The Westons produced silhouettes in the 1840s, and as the daguerreotype became more popular and more accessible to a larger market, they diversified by opening a daguerreotype studio. By the end of the decade and into the 1860s, they started to create photographs and carte-de-visites, continuing to stay abreast of consumer demands. They did not garner the notoriety like famous daguerreotypists Matthew Brady or Jeremiah Gurney, nor did they operate on their scale. In fact, New York City was filled with studios like the Westons’. In 1853, it was estimated that there were eighty-six portrait galleries in the city. (7) More research needs to be conducted on these smaller enterprises to get a better sense of the operations of a portrait-making and -selling business like the Westons’, and its relationship to a larger network of material production in mid-nineteenth-century New York. You can see this silhouette and others from the Winterthur Library and museum collection in the special loan exhibition In Fine Form: The Striking Silhouette at the Delaware Antiques Show, November 9–11, 2018. Winterthur is very grateful for funding from the National Endowment for the Arts, which has given us the ability to photograph and digitize works on paper in the collection, including these silhouettes. (2) Emma Rutherford, Silhouette: The Art of the Shadow (New York: Rizzoli, 2009). (3) J Winchester, “Daguerreotype Portraits,” The New World: A Weekly Journal 5 (November 26, 1842): 351. (4) Although not in the New York City directories until 1848, the arrival of a Robert Weston is reported in the New-York Spectator in 1837, which is backed by immigration records. “Passengers,” New-York Spectator, March 28, 1837. 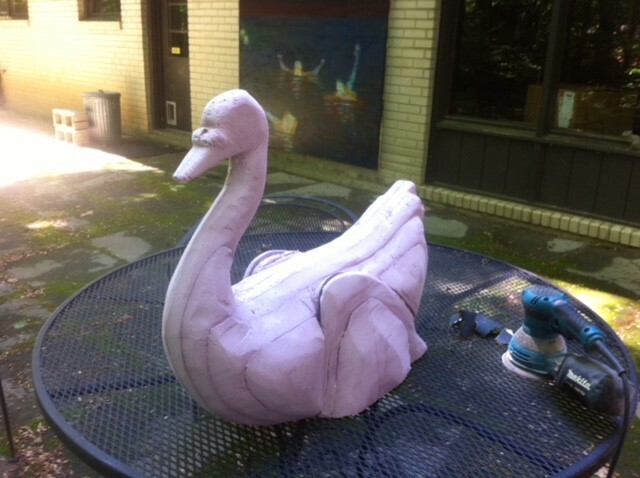 (5) Craig’s Daguerreian Registry, last modified 1998, http://craigcamera.com/dag/. (6) New York Daily Herald, March 17, 1866, 7. (7) Ethan Robey’s dissertation titled “The Utility of Art: Mechanics’ Institute Fairs in New York City, 1828-1876,” includes an appendix listing artists who displayed their work. Ethan Robey, “The Utility of Art: Mechanics’ Institute Fairs in New York City, 1828-1876” PhD diss., Columbia University, New York, 2000. (8) Beaumont Newhall, The Daguerreotype in America, 3rd ed. (New York: Dover, 1976), 55. What started as simple research into a silhouette in the Winterthur collection has progressed to a three-month trek through directories, census records, newspaper advertisements, maps, artist encyclopedias, archives, and auction catalogs. 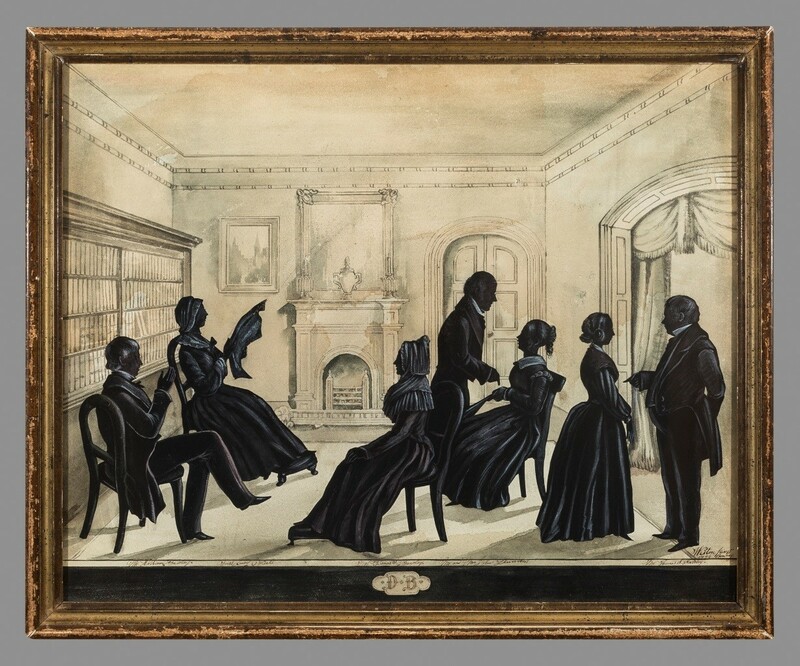 The silhouette in question, a group portrait against an interior in watercolor, has proved to be fascinating, and research has discounted previous scholarship as a new story emerges. Silhouettes were popular and cheap forms of portraiture throughout the eighteenth century and into the nineteenth century. During the period, they were referred to as “shades” or “profile miniatures,” though by the early nineteenth century they are just described as “profiles.” (1) There are various ways to produce these profiles, though the most talented artists could cut freehand, such as the most prolific nineteenth-century silhouettist Auguste Édouart. (2) Originally from France, Édouart traveled extensively through Great Britain and America creating some 100,000 silhouettes, keeping a copy or record of each one he produced. 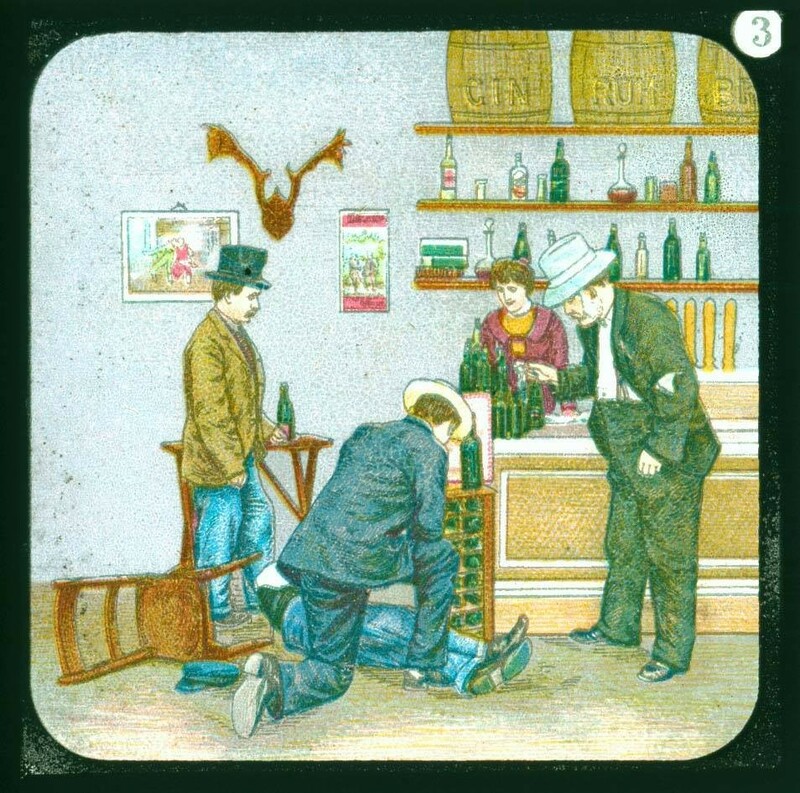 Winterthur has some examples of Édouart’s work. Other silhouettists could sketch from life or use a mechanical device like a physiognotrace to capture the profile. While many silhouettes feature one figure, this piece contains seven cut silhouettes painted black with white and tinted highlights to delineate details on the clothing and accessories. 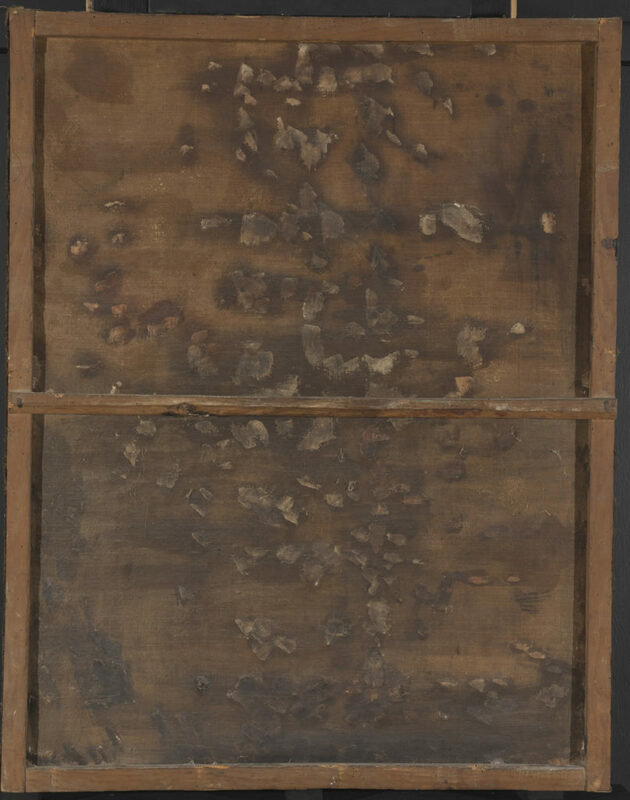 Underneath these figures the viewer can read the names of the Dennison and Barcley family and a “Miss Lucy Dale.” In the bottom right corner, the silhouette is signed “Weston pinxt./ 149 ½ Bowery.” On the reverse of the frame, an affixed label also gives the address 149 ½ Bowery. Winterthur’s records cited Mary Bartlett Pillsbury Weston as the artist, though a letter in the records from 1957 indicated that no Weston had been found in the New York City Directory at the Bowery location in the 1840s. From here, the questions grew. Conducting genealogical research on Mary Pillsbury Weston, I discovered a captivating tale of a woman determined to be an artist. Born in Hebron, New Hampshire, in 1817, she was the daughter of Baptist minister Stephen Pillsbury and Lavinia Hobart. Texts from the nineteenth century recount Mary Weston’s romantic tale: a deep yearning as a child to paint and how she ran away two times in an attempt to become an artist, finally moving to Willington, Connecticut, in 1837, painting portraits of local families. While in Connecticut, she met New Yorker Valentine Weston, brother to Willington citizen Jonathan Weston. Valentine invited Mary to come to New York, where he would employ artists to continue to instruct her and help her become an artist. After three months of living in New York, Mary married Valentine in 1840. (3) Mary Weston lived in New York until after her husband’s death in 1863. Regardless of any tentative ties to Édouart, texts from the nineteenth century only claim that Mary was a portrait and landscape artist. There is no evidence that she ever made silhouettes and that is supported by archival research. The Kenneth Spencer Research Library at the University of Kansas holds the Pillsbury Family Papers, which contain Mary Weston’s outgoing letters from 1840 to 1867. While Mary wrote about painting and selling her work, she never mentions a silhouette business. For most researchers, labels on objects are considered a gift. Other times, they only make the piece more confusing, as in the case of the Weston profile. Valentine Weston, thirty-two years Mary’s senior, appears in the New York City Directory as a blind maker, frame maker, and looking glass maker as early as 1822 and into the 1840s. His son from a previous marriage, John L. Weston, also owned a frame-making business in that same period continuing into the 1850s. Frame makers frequently sold prints and drawing in their store, thus it would not have been a leap to assume that Mary had a deal with her husband and son-in-law to create framed silhouettes for clients. 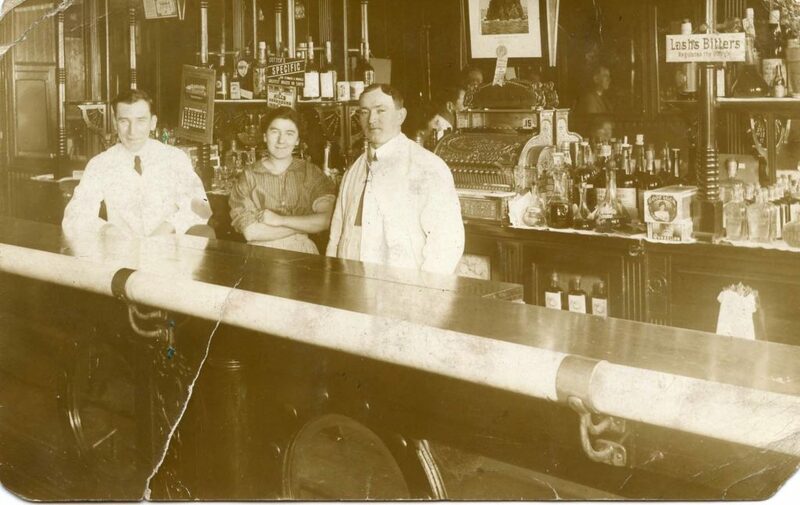 However, at no point are these two men ever listed at 149 ½ Bowery, and their businesses stayed within the lower west side. At this point, it seems unlikely that Mary Bartlett Pillsbury Weston ever made and sold silhouettes. Who was the Weston who created this silhouette? Who are the sitters? 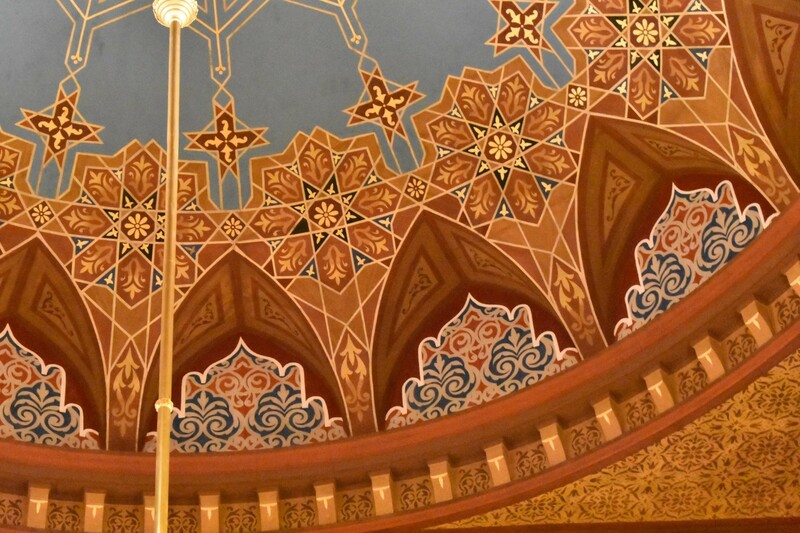 How do we know that this is even from the 1840s? These questions will continue to be pursued in part two, which will be posted on next week! (1) Emma Rutherford, Silhouette: The Art of the Shadow (New York: Rizzoli, 2009), 21. (3) E.F. Ellet, Women Artists in All Ages and Countries (New York: Harper & Brothers, 1859); H. W. French, Art and Artists in Connecticut (Boston: Lee and Shepard, Publishers; New York: Charles T. Dillingham, 1879); and Augusta Harvey Worthen, The History of Sutton, New Hampshire: Consisting of the Historical Collections of Erastus Wadleigh, Esq., and A. H. Worthen (Concord, NH: The Republican Press Association, 1890). 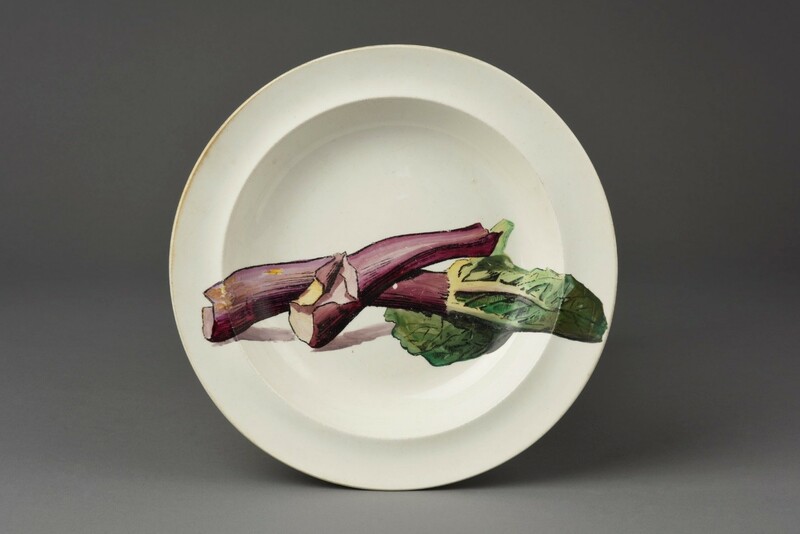 As well as studying early cookbooks, prints, and paintings, those of us who love the history of food can learn about past delicacies by studying the shapes of dishes and their ornament. In the Winterthur exhibition Dining by Design: Nature Displayed on the Dinner Table (open through January 6, 2019), such references abound! Tastes regarding how prepared foods should look when they arrived at the table have changed over time. 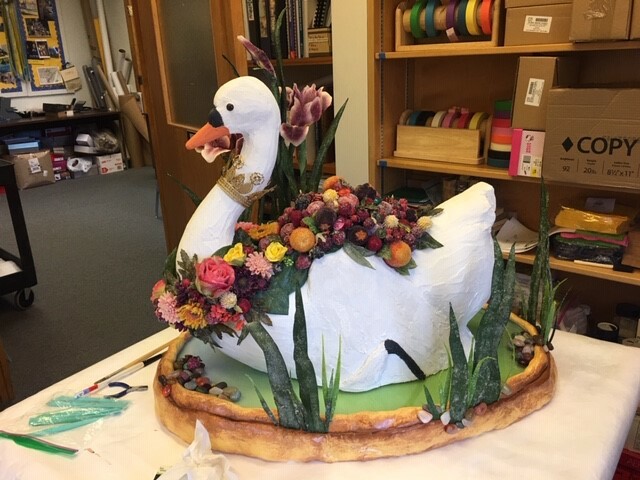 Today, for example, diners in America or Europe might not expect a cooked goose to arrive at the table complete with its head! However, based on the tureen shown above and cookbook instructions from the 1600s onward, such a display was common on many past dinner tables. 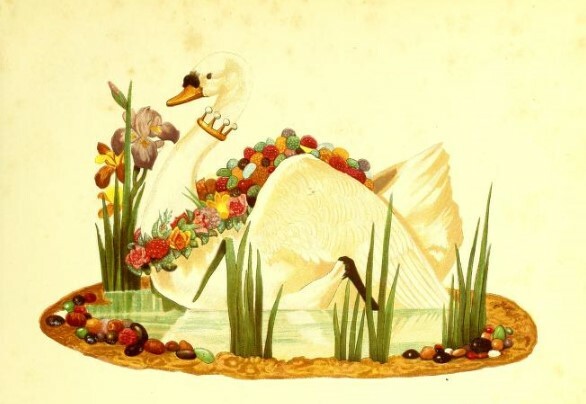 The goose tureen, originally used to serve soup or other liquid foods, additionally mimics the leafy garnishes that sometimes adorned cooked birds at the table. In the Dining by Design exhibition, the goose tureen is just one of the treasures included in the portion of the show focusing on food acquisition. 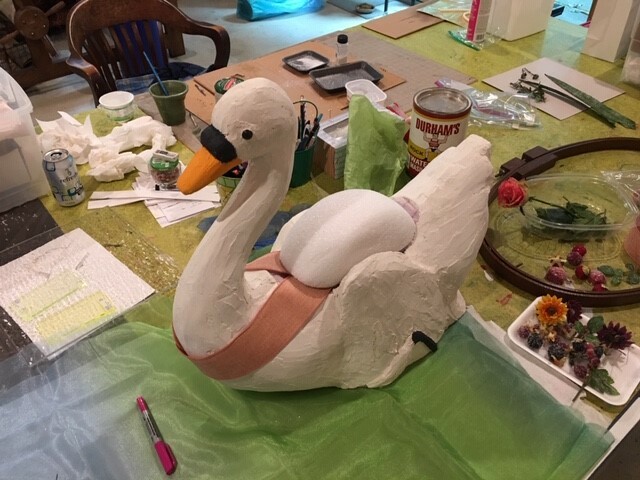 There are objects representing hunting traditions, fishing, and the raising of domesticated animals as sources of meat as well as the growing of fruits and vegetables. 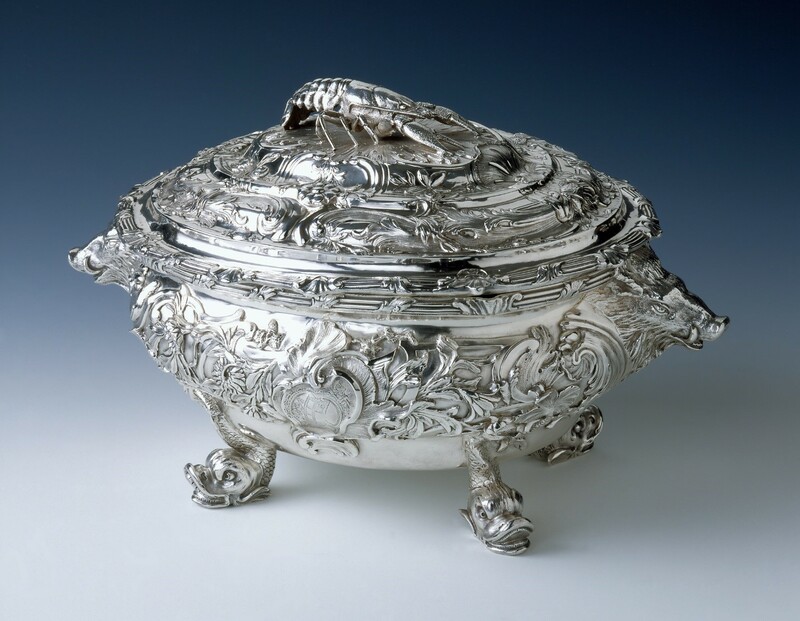 Surf-and-turf motifs ornamenting the elegant silver tureen, below, suggest that a variety of foods may have been served from the dish. Two boars’ heads flank either side of the tureen body; a realistic-looking lobster or crayfish on the lid forms a handle, and the dish is supported on “dolphin” feet. 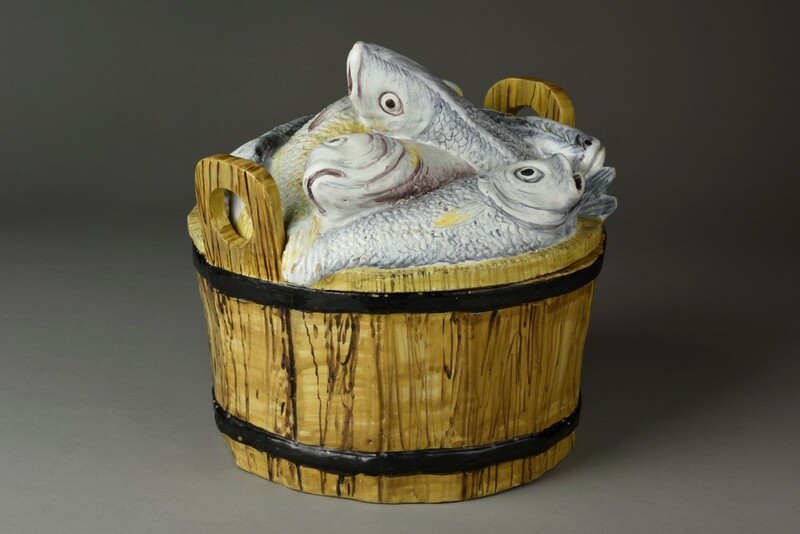 Other references to the abundance available from the sea are obvious in the Portuguese bucket-of-fish tureen, shown below. 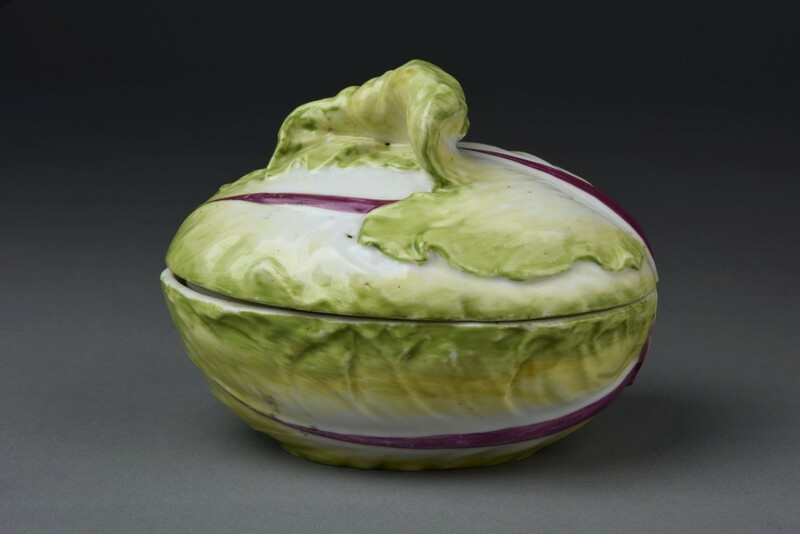 Paintings and prints from the 1600s onward show coopered wooden buckets, resembling the type forming the lower portion of the tureen as containers for different kinds of foods, including fresh fish. Hunting, of course, was another excellent source of protein and was celebrated in the shapes of and ornament on dishes. 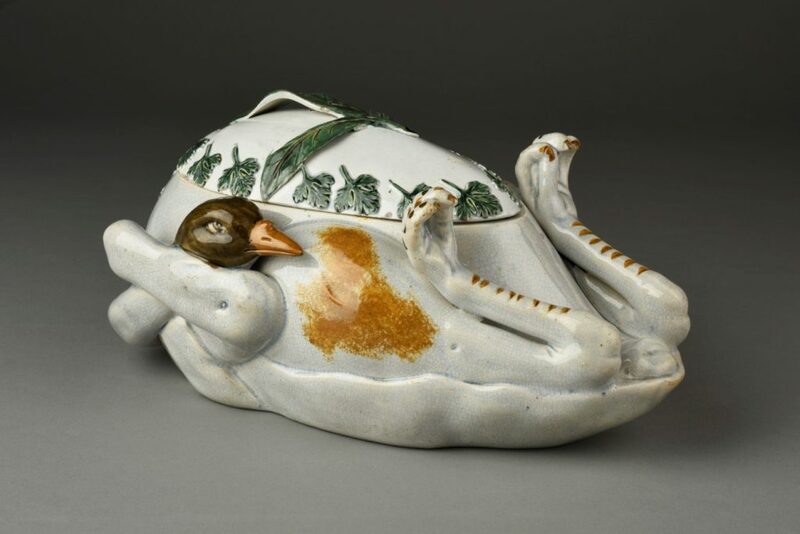 The magnificently detailed tureen and stand, shown below, not only is garnished with oak leaves from the forest but also includes the instruments of the animal’s demise! The fletching (feathers) of arrows is visible beneath one edge of the dish. 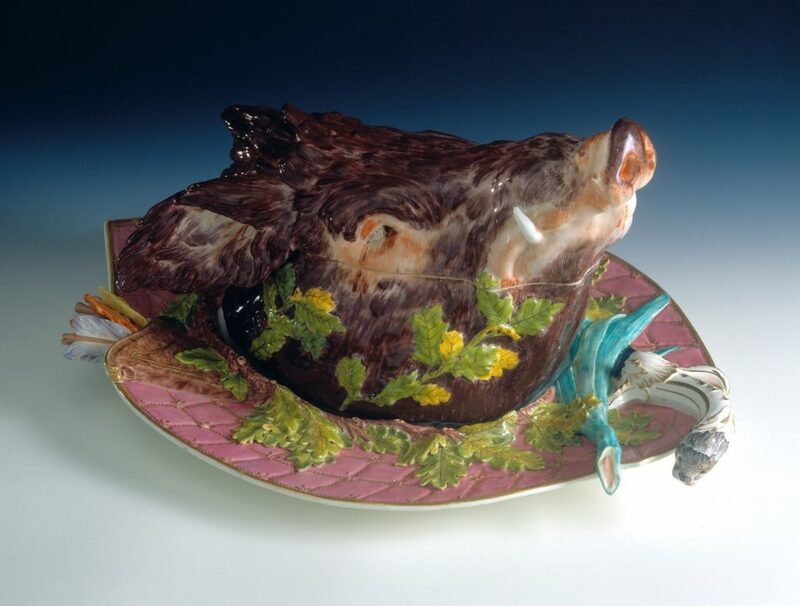 Although this vessel probably was intended for soup or stew, real boar’s heads often had the skull removed; the resulting cavity was then stuffed with one of a broad range of fillings. The young deer does not often find its way into the kitchen; hence cooks are not very profuse as to its mode of treatment. When very young the suspicion arises rather too naturally that it has not been specially slaughtered for the occasion, and this idea creates a prejudice against what is otherwise a very savoury dish. 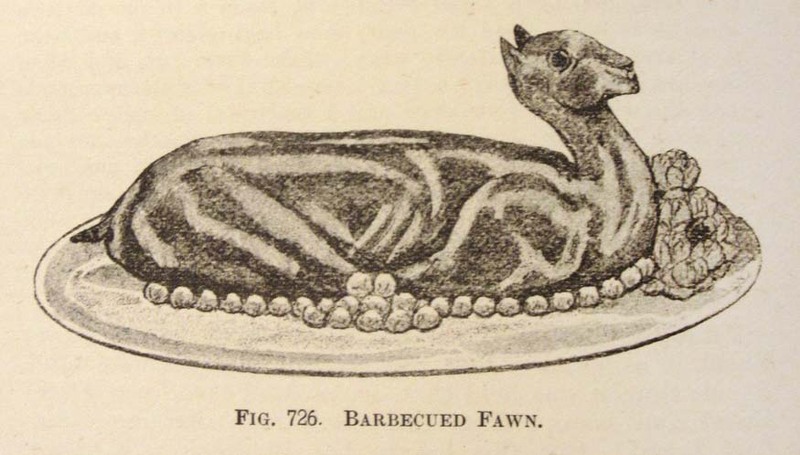 The author then merrily proceeds to provide two recipes, one for barbecued fawn and another for roasted saddle of fawn. Man (and woman!) cannot live on meat alone, however, and throughout history vegetables and fruit have formed an important part of the dining experience. Some wealthy consumers raised their own produce or bought imported or hot-house-grown vegetables or fruits, such as oranges, lemons, limes, mangoes, or figs. Private orchards and vineyards—such as at Thomas Jefferson’s Monticello in Virginia—also experimented with new types of fruits and vegetables. Most urban shoppers, however, bought produce from street-sellers, local shops, or market gardeners, some of whom grew their stock in enclosed plots or greenhouses within the city limits. 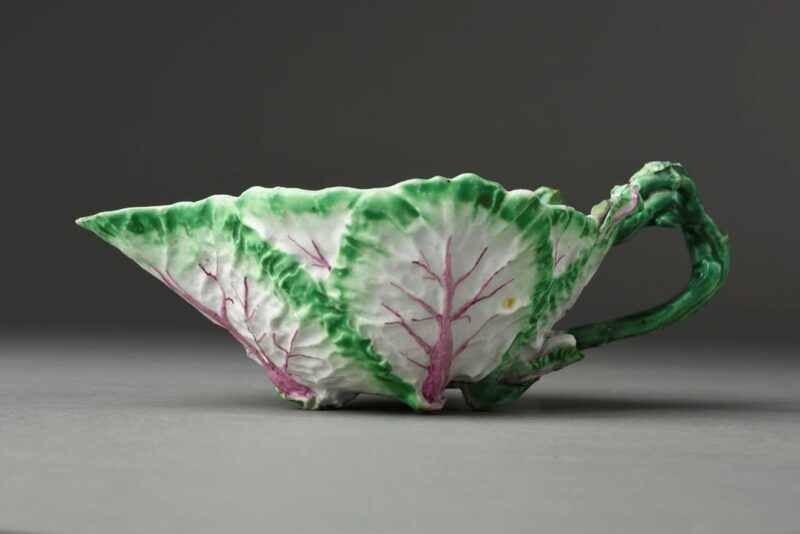 Tureens in the form of melons featured leaf-shaped stands, and some perhaps celebrated the increased availability of a broader range of fruits. Such vessels were used during any course of a dinner, whether for serving sweet or savory foods. 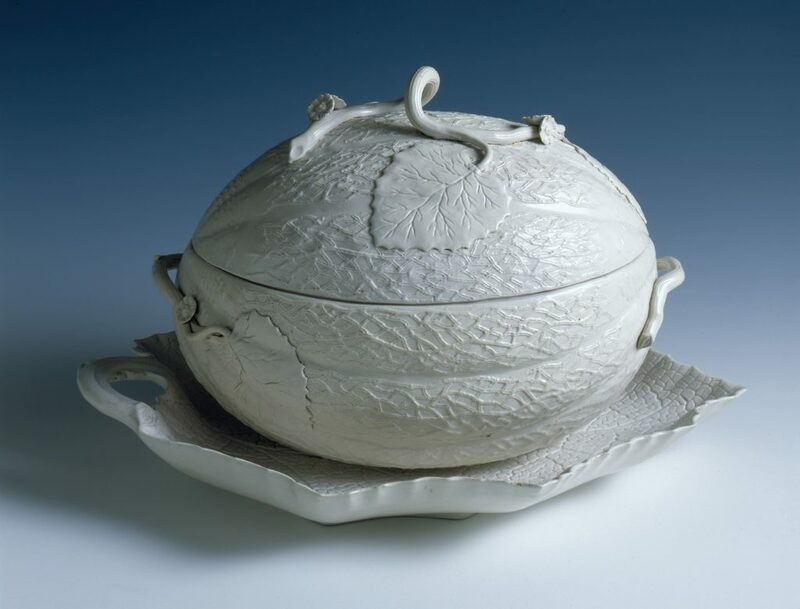 The large white melon tureen shown here most likely served soup at the first course of a dinner. Foods such as rhubarb were introduced to Europe from Asia, along with valuable silks and spices. Although the leaves of the plant are considered to be poisonous, the tart stalk has long been valued as a food. In the kitchen, rhubarb—though actually a vegetable—is commonly sweetened and prepared as if it were a fruit. The cultivation of leafy vegetables such as cabbage and lettuce dates back thousands of years, although some (such as the cos lettuce, which appeared during the 1600s) are more recent innovations. Such food was easy to grow and eventually was affordable by all levels of society. Ultimately, though, all of these wonderful dish designs were just the tip of the iceberg…lettuce. (Sorry, couldn’t help it!) 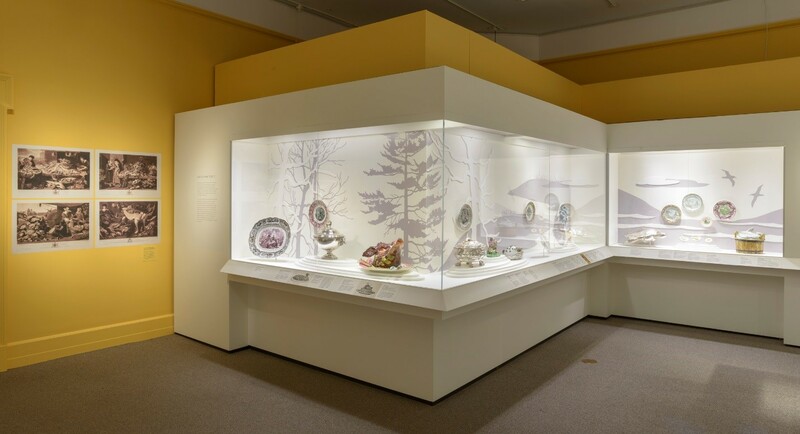 Come and see for yourself at Winterthur, when you visit Dining by Design: Nature Displayed at the Dinner Table, open through January 6, 2019. During the summer between the first and second years of the Winterthur Program in American Material Culture graduate program, fellows disperse to research their various thesis topics. For me, this meant traveling from Virginia to Vermont, to explore the world of American woolen cloth production in the final years of the eighteenth century and the first decades of the nineteenth century. A small, engraved billhead, made for Joshua and Thomas Gilpin’s Brandywine Woollen Mill. This image depicts several stages in early nineteenth-century woolen cloth making. Etching: Brandywine Woollen Mill by Joseph Cone, James John Barralet, 1814-1815, Philadelphia, PA. Bequest of Henry Francis du Pont, 1959.2089. Courtesy, Winterthur Museum. 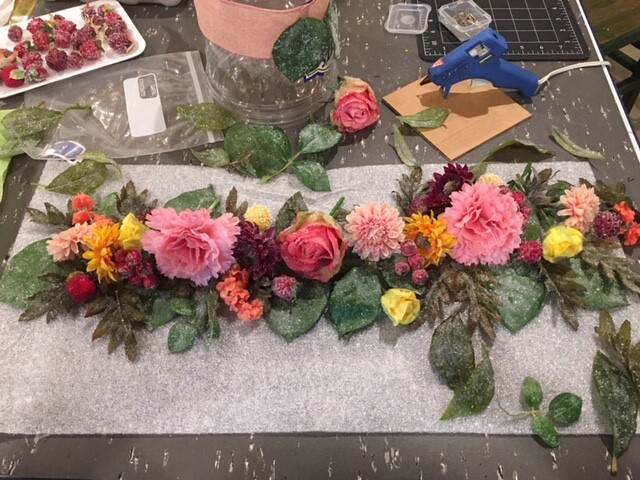 As I formulated my thesis proposal over the winter, I knew I wanted to find a topic which would allow me to explore themes of craft, making, and invention. My longstanding interest in textiles and a newfound love of water-powered mills, meant that I decided to undertake a study of fulling and woolen finishing: the final steps in cloth production, which happen after the cloth leaves the loom. For woolen textiles, these last few steps are transformational, often defining what the cloth will eventually be suitable for. While English clothiers were some of the finest in the world, the United States lagged far behind. In the decades after the Revolutionary War, many of these steps were mechanized. Therefore, this trade presented an opportunity to study both a traditional craft and themes of technological innovation. To understand the work of both cloth finishers and the machines that were invented to assist them, I first had to understand what their work was accomplishing. This meant looking at the cloth itself. To do this, I first looked at textile samples in the Winterthur Library and later visited the collections of Colonial Williamsburg, Mount Vernon, and Fort Ticonderoga, where I was able to examine a variety of eighteenth- and nineteenth-century garments in person— including three coats worn by George Washington! This helped me to develop an understanding of how finishing affects the final look and function of a piece of cloth. This up-close examination has helped me to train my eye, allowing me to see the range of qualities in cloth finishing that were present during my period of research. 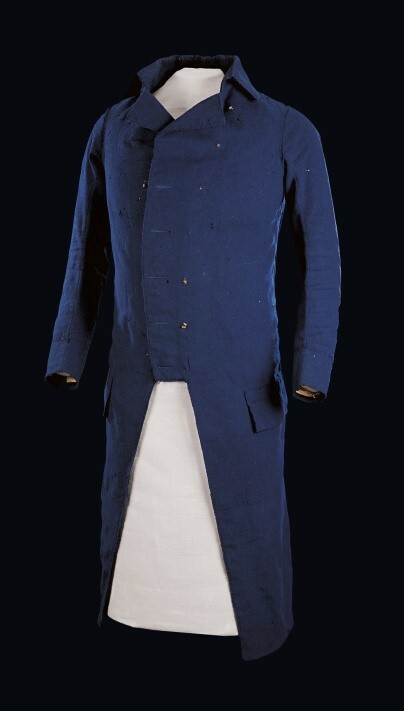 This coat belonged to George Washington and was probably worn by him in the 1790s. It has a provenance that connects the textile it is made of to the Hartford Woolen Manufactory, which operated in Hartford, Connecticut, at the end of the eighteenth century. Accession number: W-1514. Courtesy, Mount Vernon Ladies’ Association. 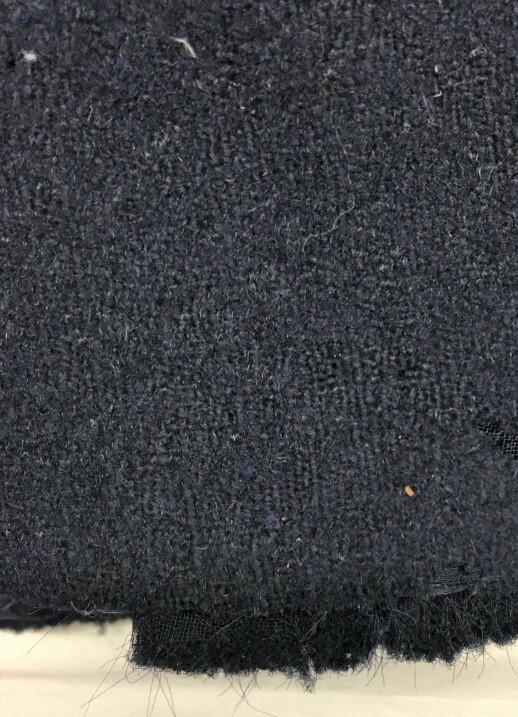 Close-up view of blue woolen textile, showing the weave structure. Another portion of my research involved studying written primary sources. At the end of July, I presented some of this research at the 2018 Textile History Forum, in Marshfield, Vermont. My talk focused on the records on one Pennsylvania fulling mill, which survives in the Chester County Historical Society library. Presenting at the forum was an opportunity to get my preliminary research in order but also to get feedback from a wide range of textile historians and practitioners. Since the Marshfield School of Weaving, which hosted the event, recently acquired several pieces from the now-closed American Textile History Museum, the forum gave me an opportunity to examine some of the textile tools that I had been reading about.I left feeling invigorated and buoyed up by the support my talk had received from fellow scholars. 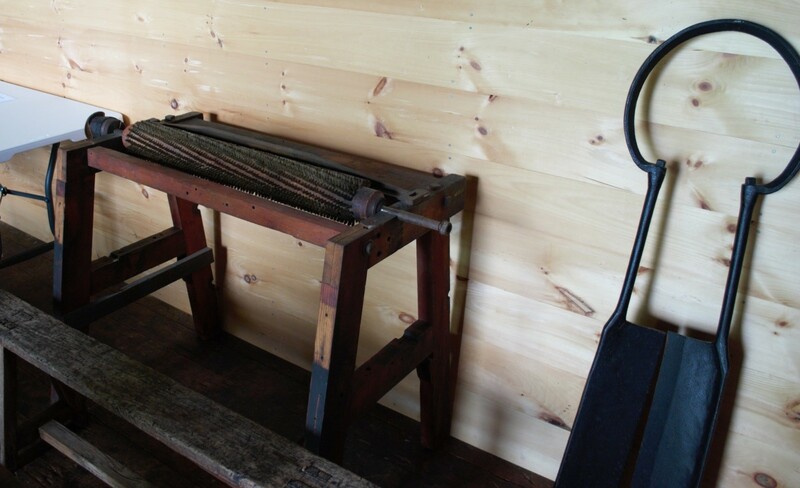 This early nineteenth-century napping machine and pair of massive hand-operated cropping shears, are both tools that were used to finish the surface of woolen cloth. 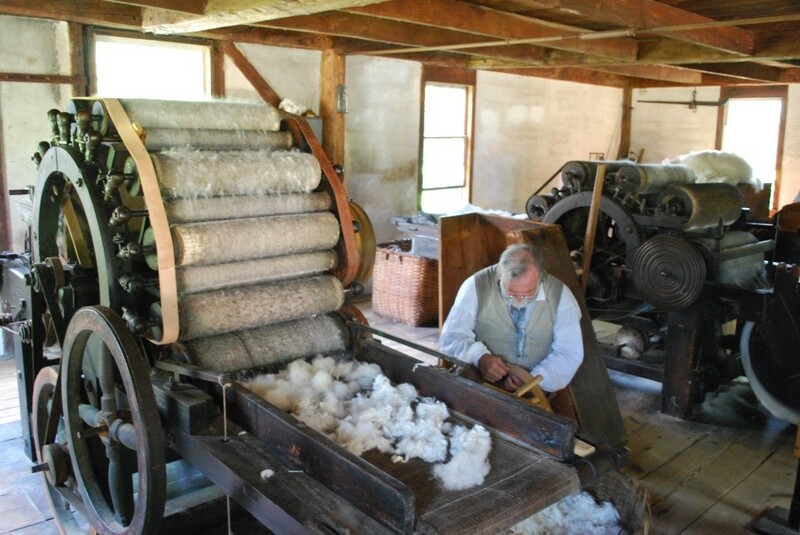 After studying texts, textiles, and tools, there was still one element of woolen finishing I felt I needed to understand to do my topic justice—the water mills that were the power source for textile finishing machines well into the nineteenth century. I decided to contact Old Sturbridge Village and ask if I could volunteer in their mill sites for a day. While Old Sturbridge Village does not have a fulling mill, it does have three operable water-powered mills: a grist mill, which is currently being repaired, a saw mill, and a carding mill. In August, I spent a day working with Historian and Curator of Mechanical Arts Tom Kelleher in the saw mill and carding mill to learn how water, miller, and machine worked together in this ancient power source. Historian and Curator of Mechanical Arts Tom Kelleher repairs a leather bent, which makes Old Sturbridge Village’s carding mill run. The carding machine is original to the 1820s and still runs almost daily at the museum. This opportunity let me feel (literally, since water mills often vibrate with power) what it might have been like to work inside one of these early industrial sites. Exploring how the rotary motion of a waterwheel can be transformed to do many different mechanical jobs also helped me to comprehend the potential that the inventors of the Industrial Revolution saw for developing powered machines to do traditionally hand-operated tasks. After a summer of research, I’m excited to create a narrative that tells the story of cloth finishing through not only words but also objects, sites, and landscapes and discusses a specific trade and the people who performed it as well as the economy and environment in which it operated. A mere shadow, faintly visible in raking light, is all that remains of the script that once spelled “Philadelphia” on the drawer front of Winterthur’s recently acquired double cabinet. This drawer may be blank, but gold painted letters still adorn the cabinet’s eleven other drawers. Labeled to the left of Philadelphia is the name of the winemaking island of Madeira; to the right is Jamaica; “Teneriffe,” one of Spain’s seven Canary Islands, can be found painted on the drawer below; and names of other prominent eighteenth- and nineteenth-century ports and colonies fill out the mix. All taken into consideration, it became clear to Josh Lane, Winterthur’s curator of furniture, that the cabinet he was examining at the 2016 Delaware Antiques Show was a remarkable document of Atlantic world history. 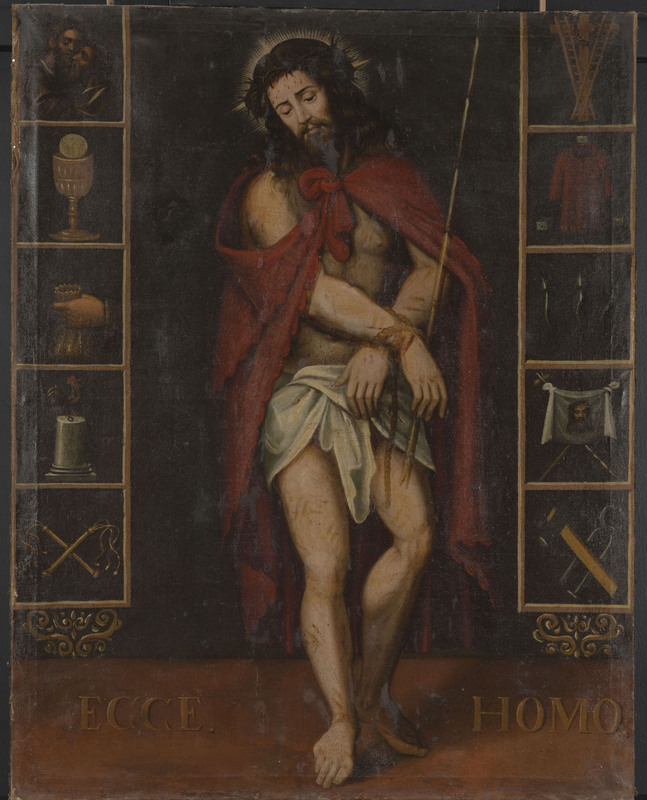 Purchased by Winterthur, the object offered a unique opportunity for study and soon became the focus of the first student-curated exhibition in the Society of Winterthur Fellows Gallery. 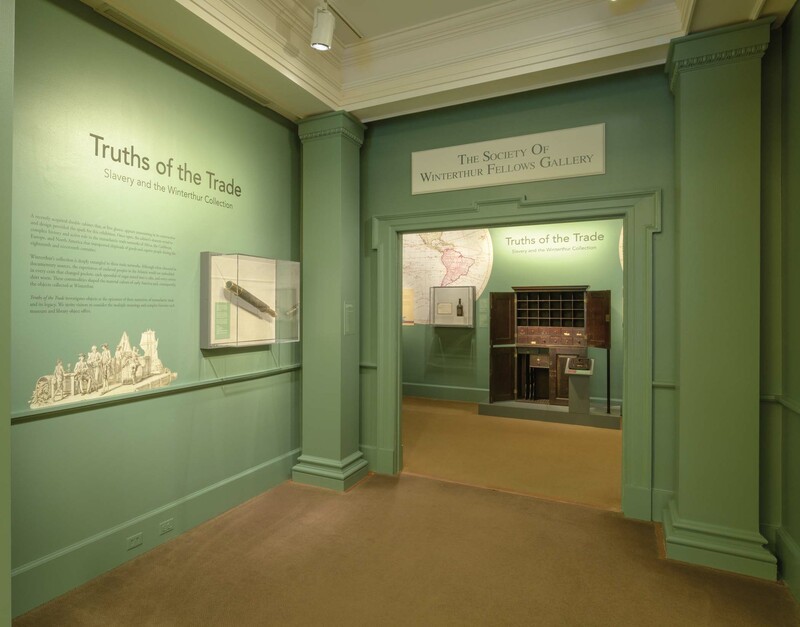 Thanks to months of research by the students, aided by scholars across the country, the cabinet is now one of Winterthur’s primary references on the transatlantic slave trade. 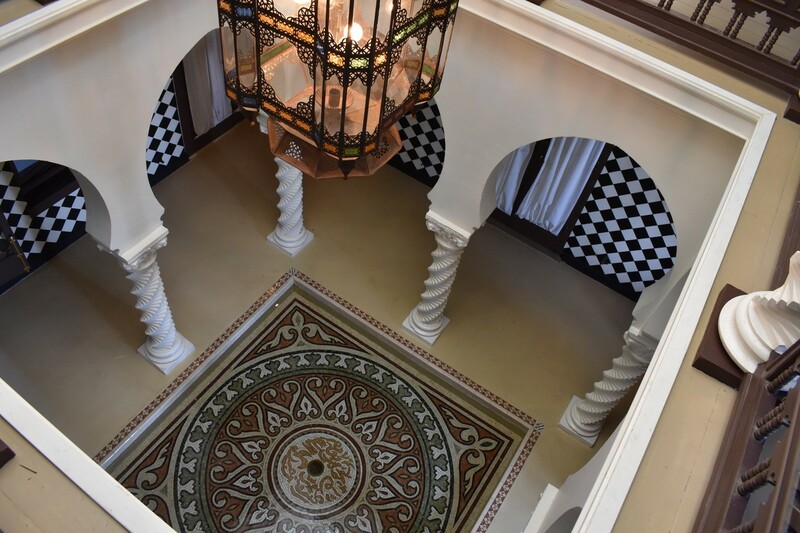 The use of island mahogany and English oak situate the piece in the world of Atlantic commerce, but its most compelling story is revealed when its locks are turned and doors are opened. 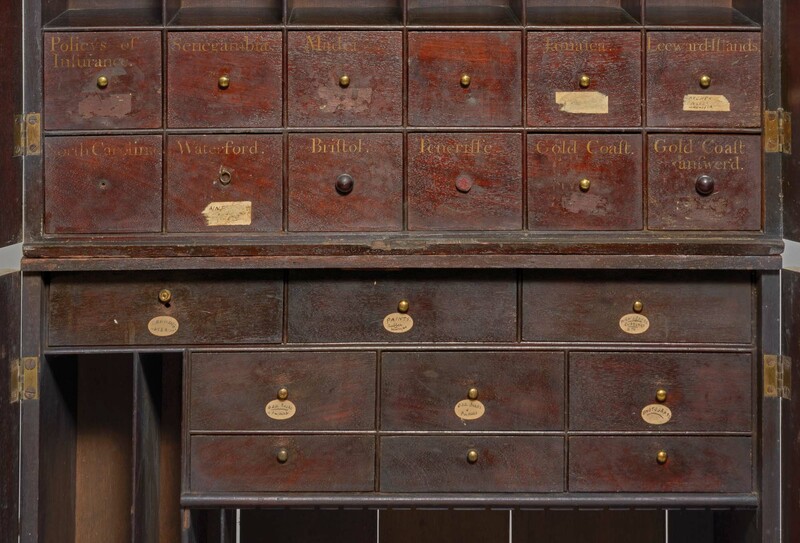 Drawers labeled with the names of ports and colonies reconstruct networks of trade: Senegambia, Madeira, Jamaica, Leeward Islands, North Carolina, Waterford, Bristol, Teneriffe, Gold Coast, and Philadelphia, revealing participation in the transatlantic trade between Africa, the Caribbean, Europe, and North America that transported shiploads of commodities and captive people during the eighteenth and nineteenth centuries. The Winterthur collection is deeply entangled in these trade networks. The commodities that crossed the Atlantic defined the material culture of early America―the very things Henry Francis du Pont and the museum collected. The Atlantic trade involved a wide variety of raw materials and refined goods, but slavery was its engine. Captive Africans and the products of their forced labor flowed into ports like those named on the double cabinet, making possible the luxury and beauty enjoyed by consumers in the past as well as visitors to the museum today. Through ports came sweet sugar and bitter suffering, beautiful mahogany and hideous brutality, gleaming gold and dark dehumanization. The exterior of the double cabinet appears, at first glance, unassuming in its construction and design. Despite the modest appearance, the island mahogany used as the primary and secondary wood was an expensive material first harvested in the Caribbean as a profitable by-product of clearing land for sugar plantations. 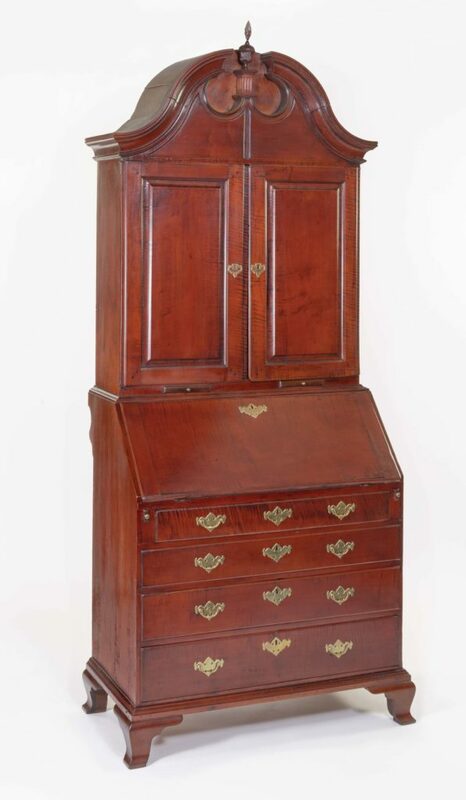 Cabinetmakers and consumers throughout the Atlantic world later revered the wood for its dark burgundy color and ease of use. 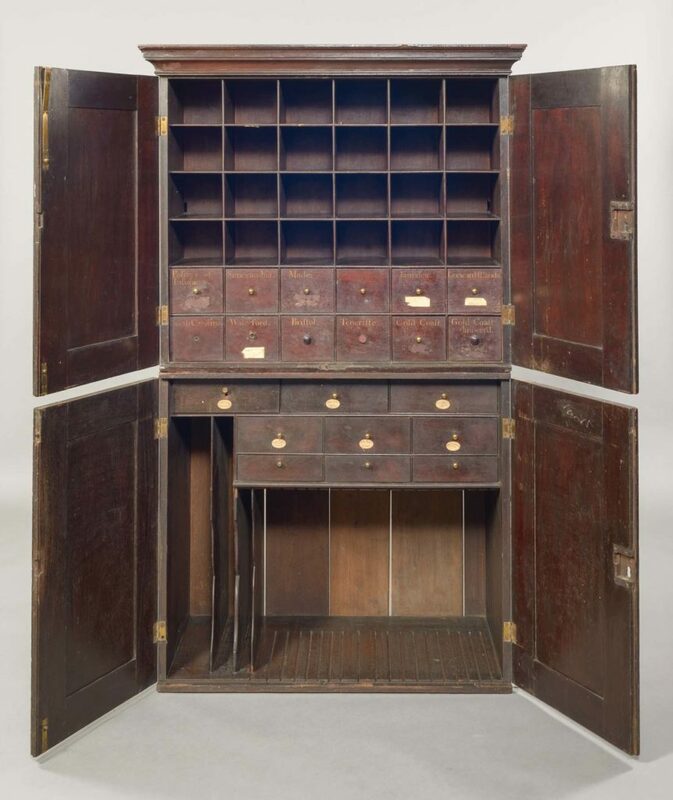 Fitted to the mahogany doors of the cabinet are inset brass locks that served as extra security to protect the valuable insurance policies, shipping documents, and other records held within the drawers and shelves. In addition, the cabinetmaker built locking compartments into the sides of the cabinet for further safekeeping. Close examination also reveals fine attention to precise dovetail construction, suggesting investment of care and skill on par with other case pieces such as desk-and-bookcases and escritoires. It is possible that the name of the original owner, maker, and origin of the cabinet will never be uncovered. 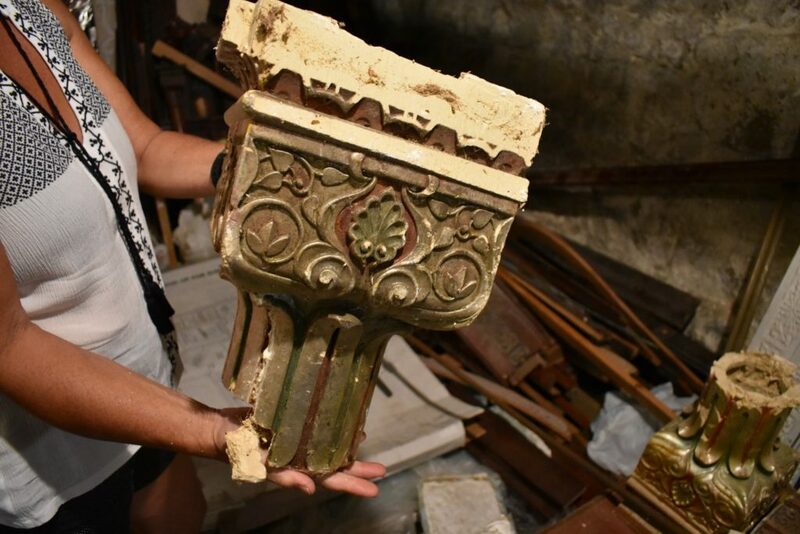 What is known, however, is that the size of the storage receptacles and the labels with geographic locations and letters of the alphabet indicate that the piece functioned as a filing cabinet. The owner would have arranged paperwork dealing with each Atlantic world location in order to organize his business interests. The duplicate mention of “Gold Coast” on two of the drawers offers the best evidence of the cabinet’s use as an organizational tool. The Gold Coast, an area of Africa in what is now Ghana, was an active site of the slave trade in the eighteenth century. The labels “Gold Coast” and “Gold Coast Answered” suggest that the owner had enough correspondence from this region to fill two compartments and perhaps conducted more business there than in any of the other port or colony represented. In addition to indicating geographic locations, the top drawer of the cabinet, furthest to the left, is labeled “Policys of Insurance.” Filed away were undoubtedly insurance policies penned in ink on sheets of handmade paper. Winterthur’s manuscript collection holds several such examples issued to eighteenth- and nineteenth-century merchants to protect ships and cargo with significant monetary value. Like insurance today, these policies covered loss or damage to capital. Because their cargo often included enslaved humans, merchants involved in the Atlantic trade obscured the language in these documents to ensure full protection. Students and staff at Winterthur continually revisit the collection to ask new questions and reinterpret the histories of objects. Truths of the Trade was one such project. 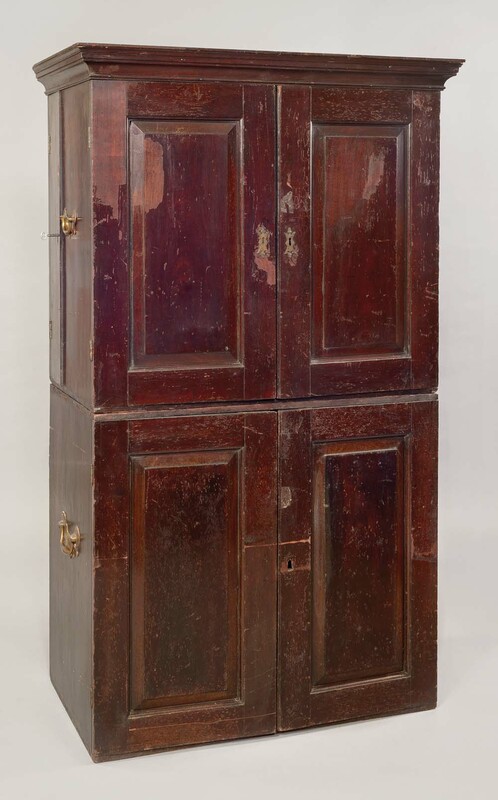 It permitted graduate students from the Winterthur Program in American Material Culture and the University of Delaware Department of Art History to consider how changing cultural and institutional perceptions of race continue to influence the acquisition of objects for the museum―all through the study of an unimposing double cabinet with a remarkable story to tell. 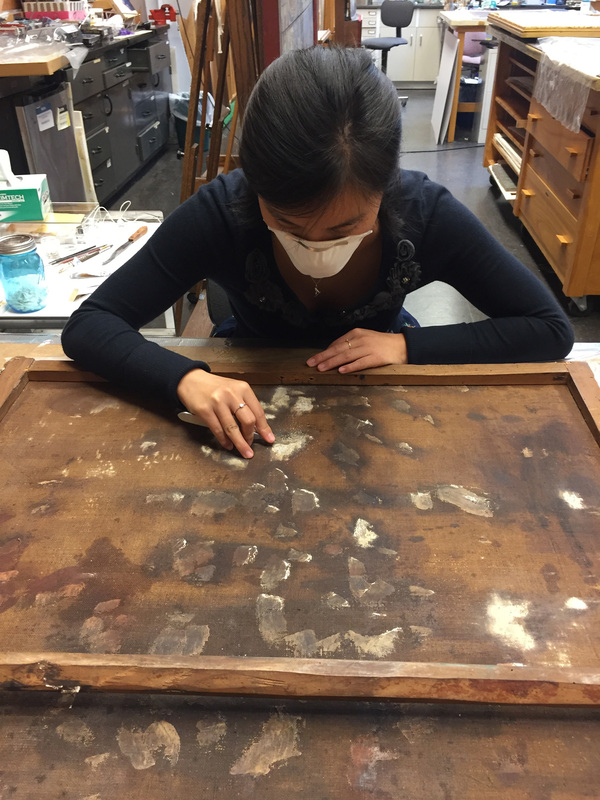 Post by J. Lara and Alexandra Rosenberg are Lois F. McNeil Fellows in the Winterthur Program in American Material Culture. Perched on the south fork of the eastern end of Long Island, East Hampton today is best known as one of the towns comprising “the Hamptons,” a wealthy summer resort. In the eighteenth century, however, it was an isolated and largely self-sufficient community of small farming and fishing villages scattered over 70 square miles and connected to distant markets by sea. When families from those communities needed a clock, a set of chairs, a hay rake, or a cart wheel, they turned to the Dominy family of craftsmen. When the township voted to build a wind-powered gristmill, the elders commissioned a Dominy. Between the early 1760s and 1840s, three generations of this local craft dynasty—grandfather, Nathaniel IV (1737−1812); father, Nathaniel V (1770−1852); and son, Felix (1800−1868)—made and repaired clocks and watches and provided general woodworking, cabinetmaking, and carpentry to thousands of families in eastern Long Island and the Connecticut coast. They filled a critical need for multi-skilled woodworkers and metalworkers. Remarkably, the nearly complete contents of the Dominy woodworking and clockmaking shops survived in situ until 1946. 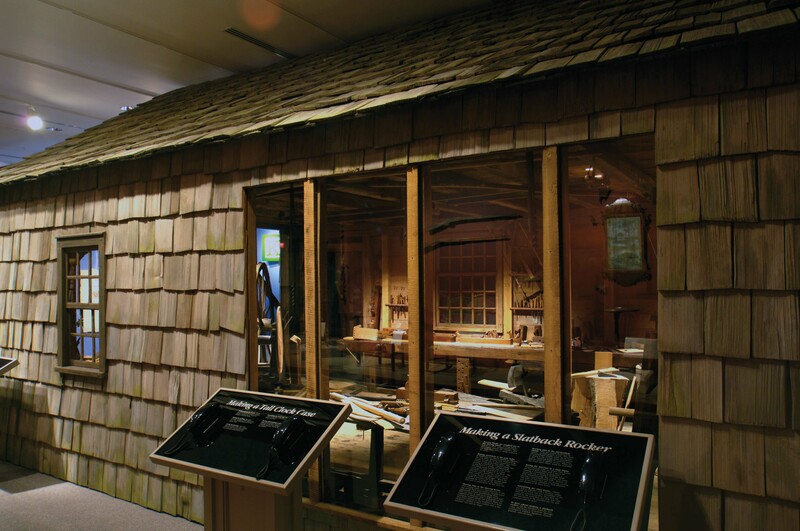 Acquired by Winterthur in 1957, the Dominy tool collection, comprising more than 1,000 hand tools and larger pieces of equipment, has been on display since 1960 in timber-frame structures that closely replicate the original shop buildings. 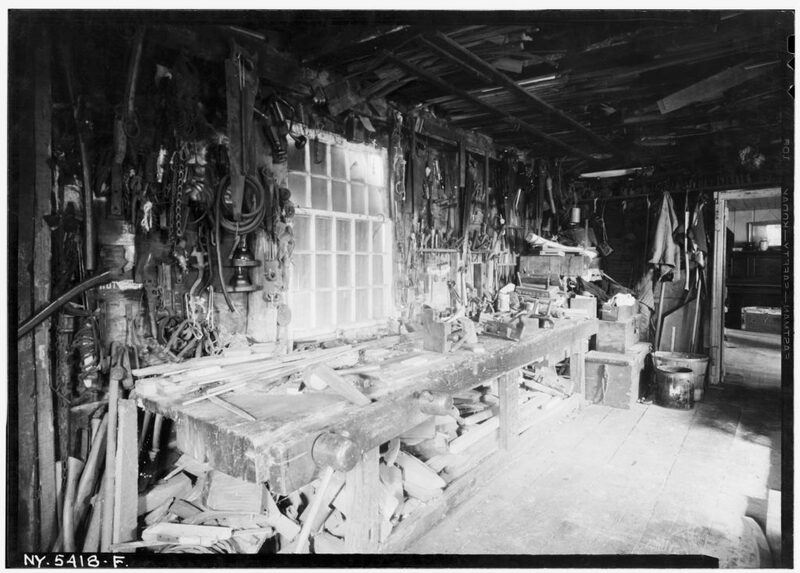 The tools, clocks, furniture, and farm equipment as well as the original shop buildings now under restoration by the town of East Hampton and the shop accounts and family papers housed in Winterthur Library tell a more complete story about a family of craftsmen and their pivotal role in the community than any other grouping of tools, documents, and artifacts in the country. 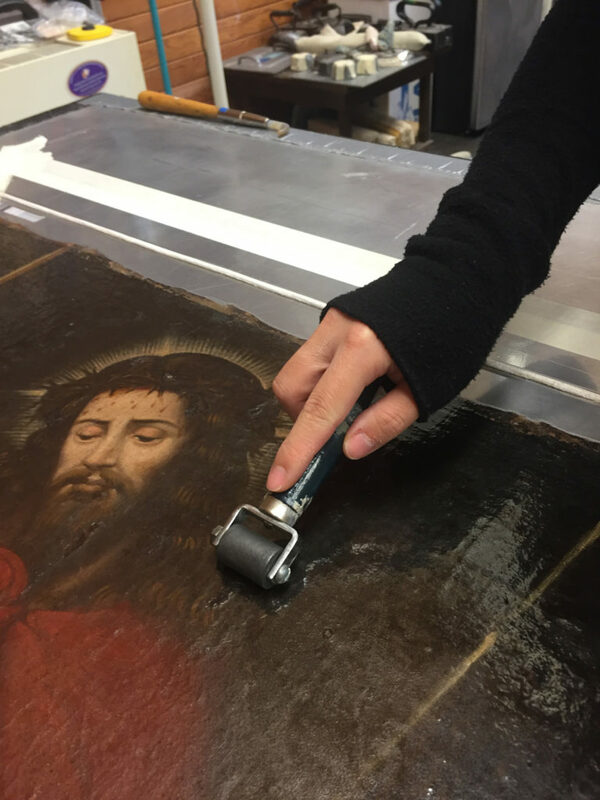 Recognizing the importance of this collection as a national treasure, Winterthur is currently planning the reinstallation of the Dominy Gallery with improved lighting, new displays, and digital media designed to enable deeper exploration of the artifacts and documents. The Dominy family arrived in East Hampton probably around 1669, twenty years after settlers from Lynn, Massachusetts, founded the town. Listed in property deeds as a carpenter and surveyor, Nathaniel III (1714−1778) established the Dominy woodworking tradition and probably trained his son, Nathaniel IV. In addition to general carpentry and cabinetmaking, Nathaniel IV made clocks and repaired watches. He taught woodworking skills to his son, Nathaniel V, who, from 1787 onward, worked as a house carpenter, millwright, wheelwright, surveyor, and cooper. Felix learned the fundamentals of clockmaking and watch repair from Nathaniel IV and gained additional experience in the shop of a New York City watchmaker and repairer in the years 1815 to 1817. 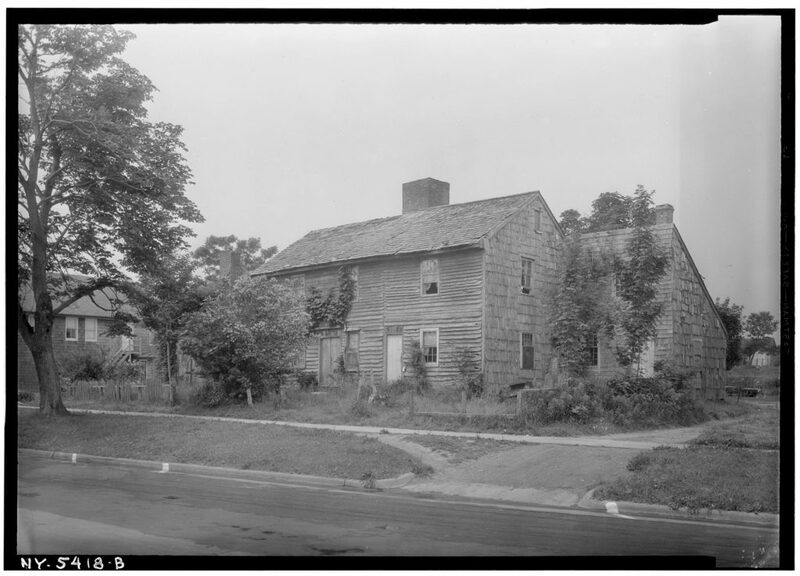 The Dominy family lived near the center of East Hampton village and owned and cultivated 100 acres of farmland scattered throughout the township. About 1715 they moved into a new house apparently built around the core of an earlier structure on the property that had a parlor below a second-floor chamber and a lean-to kitchen. Between 1745 and 1760, Nathaniel III doubled the size of the house with a two-story addition across the front. He also extended the lean-to, adding a woodworking shop of 485 square feet. Faithfully reconstructed at Winterthur, the shop is equipped with the original workbenches, shelves, racks, and other fixtures in the same positions that the Dominy craftsmen installed them, including a great wheel lathe, the only known eighteenth-century example, and a pole lathe, each probably made between 1750 and 1800. 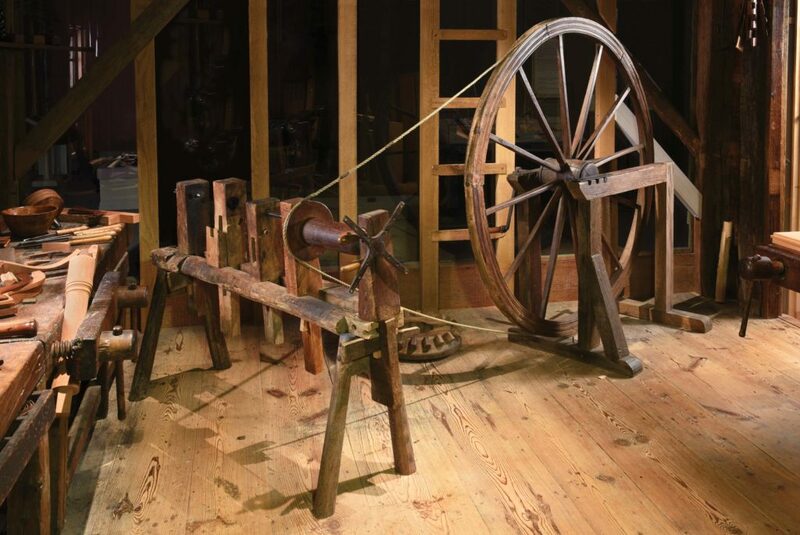 The great wheel lathe probably made by Nathaniel Dominy IV between 1775 and 1800, shown in the Dominy Gallery. As itemized in their accounts, the craftsmen made more than 1,700 objects in the woodworking shop with tools forged primarily in England and purchased in New York City through East Hampton merchants who sailed weekly to Manhattan. In 1798 Nathaniel IV constructed a clock shop at the southeast corner of the house, built around a chimneystack containing a flue for a forge on one side and hearth on the other. Craftsmen there made some 80 cast-brass clock works, from simple to complex, for the next thirty years. Although they made no watches, Nathaniel IV and Felix did a brisk business repairing them. 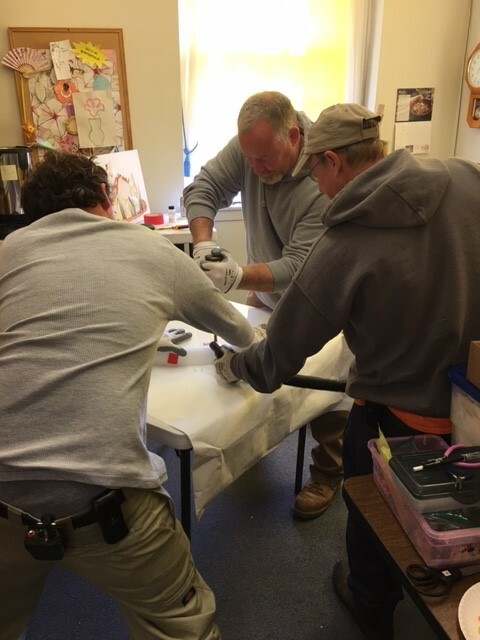 Their affordable rates attracted many clients from Suffolk County and coastal eastern Connecticut, and Felix listed more than 1,000 in a separate book for watch repairs. After 1810, cabinetmakers newly arrived in the village of Sag Harbor began to compete with the Dominys for market share. In 1823 businessman Nathan Tinker advertised a “furniture warehouse,” well stocked with readymade furniture purchased wholesale in New York City and shipped up the Sound. After some seventy-five years supplying the needs of the community, the Dominy furniture business was undercut by the availability of stylish, inexpensive factory-made furniture. Similarly, the death knell for the Dominy clockmaking business was sounded with the advent of mass-produced, low-cost Connecticut shelf clocks. Priced out of the market, the Dominys stopped making clocks altogether in 1828. 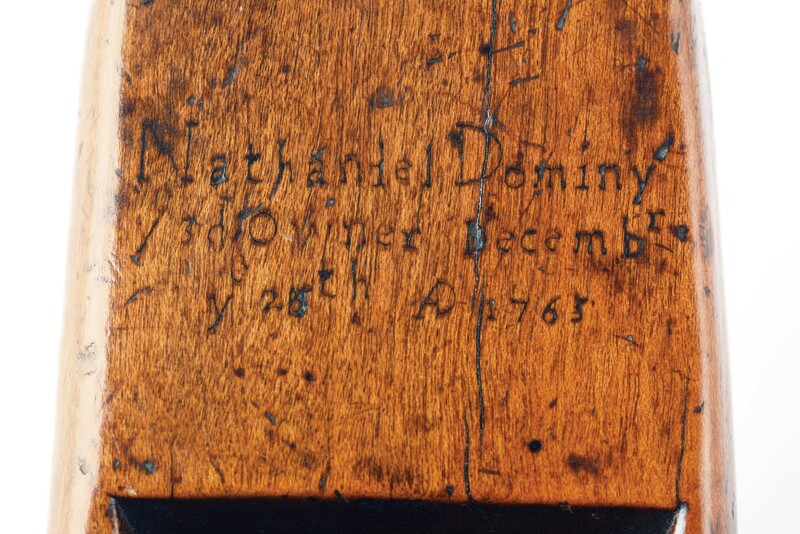 By 1835, at age 65, Nathaniel V pulled back from full-time woodworking. That same year, no longer able to earn a living from clockmaking and watch repair, Felix moved from East Hampton for more lucrative work as keeper of the Fire Island lighthouse. By 1844 he was managing a summer hotel on Fire Island, and from 1861 to his death, in 1868, he owned and managed the Dominy House, a resort hotel in Bay Shore. 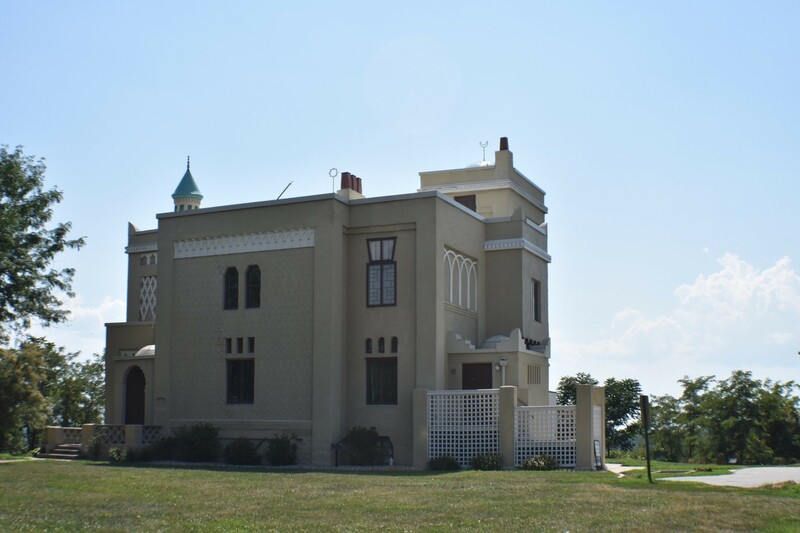 The family house, shops, and all contents passed to descendant Nathaniel VII and, after his death in 1910, to his son, Charles Mulford Dominy, also a woodworker. By 1940, the homestead had fallen into disrepair; fearing its loss, the Historic American Building Survey (HABS) dispatched a team to document the structure with photographs and measured drawings. The Dominy woodworking shop installed at Winterthur. The following year Charles sold the property. The new owner offered to sell the structure to the town for a museum, but funds were not raised. Fortunately, before the house was dismantled in 1946, Charles’ children removed equipment and tools from both shops for safekeeping, storing larger items in the barn of a Southampton antiques dealer and placing hand tools, shop records, and family papers on loan at the East Hampton Historical Society and East Hampton Free Library. As demolition began, a private buyer stepped in and purchased both shops, moved them to his beachfront home, and combined them to make a guesthouse. Thanks to the generosity of two subsequent homeowners, the shops were ultimately donated to East Hampton with money to fund their reconfiguration and attachment to a replica of the exterior of the Dominy house. In 1957 Charles F. Montgomery, director of Winterthur, became aware of the Dominy tools. 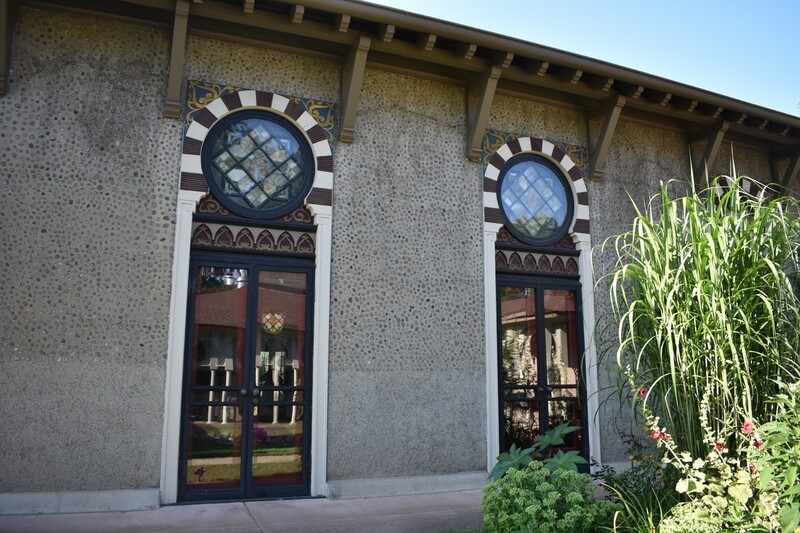 With the support of Henry Francis du Pont, he pursued the acquisition of the collection, which was made possible through the generosity of Dominy family members and funds provided by Henry Belin du Pont. 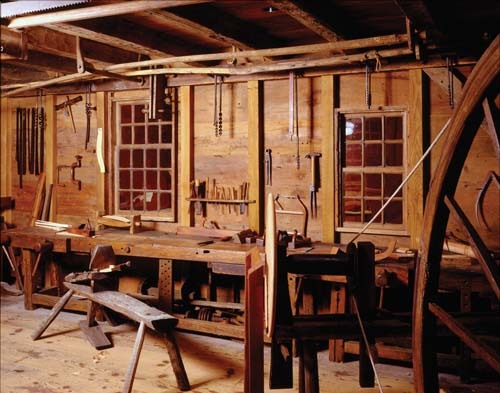 Replicas of the shops with the original tools opened to the public at Winterthur in 1960, followed by the 1968 publication of With Hammer in Hand: The Dominy Craftsmen of East Hampton, New York, the definitive study of the Dominy archives, tools, furniture, and clocks by Curator of Collections Charles Hummel. The Dominy shops reveal much about life, work, and craftsmanship of an earlier time, and the planned updates to the gallery will allow Winterthur to bring the remarkable story to an even wider audience. A selection of tools used by the Dominys. 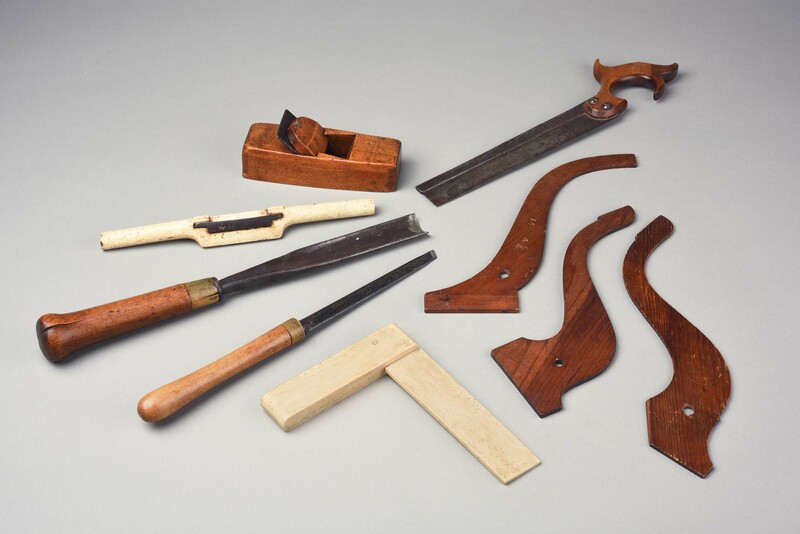 Counterclockwise, from top: Smoothing plane, dated 1763, maple and satinwood; Spokeshave, ca. 1800, whalebone stock; Gouge, ca. 1800, wooden handle and horn ferrule; Turning chisel, repurposed steel sword blade inscribed “ANNO” and “1600,” set in a wooden handle with horn ferrule; Square, ca. 1800, whalebone; Wooden patterns, 1790−1830, for the legs of candlestands and tea tables; Dovetail saw, 1790−1830. Gift of Robert M. Dominy 1959.42; Museum purchase 1957.26.209, .117, .119, .207, .301, .303, .305, .23.